Y'all ... We have new bags! Fresh bags and fresh coffee. It doesn’t get much better. Our new look bags feature a unique metric that reveals the different tastes each of our coffees bring to your mug. Our simple metric shows six flavor characteristics: Nutty, Fruity, Chocolate, Citrus, Sweet, and Floral. Beside each flavor is a sliding bar that reveals the level of intensity. Our naturally processed Ethiopia Guji Highlands, for example, has high levels in the fruity and sweet categories. 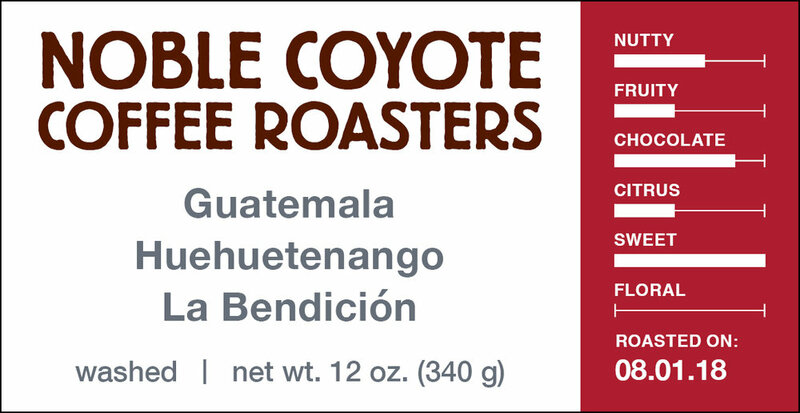 The La Bendición Guatemala shows a lofty level for nutty, and our Barking Dog Espresso blend is off the charts when it comes to chocolate and sweetness. The six flavor characteristics come from the Coffee Taster’s Flavor Wheel. Attendees of our cuppings and classes know that we use the flavor wheel as a tool to determine the distinct tastes of our coffee offerings. If you’re interested in seeing our specific tasting notes you can find those described with each of our coffees. You’ll also notice each label has a streak of color around the flavor scale. Those aren’t chosen by random. We chose these colors because they are symbolic of the hues of coffee cherries as they develop and ripen in nature. Our special seasonal offerings and blends will be identified with blue. We hope you enjoy our new look!